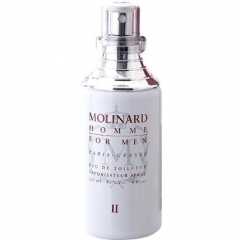 Molinard Homme II is a popular perfume by Molinard for men and was released in 1996. The scent is sweet-oriental. It is still in production. Same strength and great composition. Same WOW at th first sniff! My husband loves it. The thing is that from now on I have to tell him when it's my turn to wear Habanita . Today was a gender-bending fragrance day for sherapop. First I wore Heeley IRIS DE NUIT (review to follow), then I tested a bit of Bond no 9 HARRODS FOR HIM before donning a full serving of COOPER SQUARE. Yes, I luxuriated in labdanum-drenched lavender this afternoon. Now I am wearing Molinard HOMME II. Can we talk? This stuff is simply remarkable. I occasionally wear this fragrance to bed, and it smells even more beautiful in the morning, so it does not fall apart or degrade, the tell-tale signs of cheap-o juice. It's smooth and creamy and a bit spicy and sweet, and just a bit masculine, but in a gentle giant way. I just love this stuff. So why does no one talk about it? My theory: Molinard suffers from the dreaded fifty-cent whore problem. By selling their wares so cheaply, they drive serious perfume users away in droves. But you need to smell this stuff, guys--and gals! I'm thinking very seriously of purchasing a case of bottles of this juice to distribute to all of my male friends--and females, too! Write the first Review for Molinard Homme II!